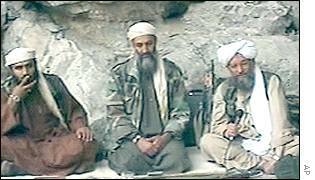 Sulaiman Abu Gaith, Osama bin Laden, and Ayman al Zawahiri, from an al Qaeda propaganda tape. Image from BBC/AP. 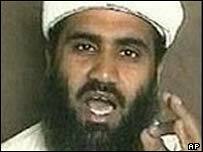 Iran has allowed an al Qaeda terrorist who served as Osama bin Laden’s spokesman to return to Afghanistan. Sulaiman Abu Ghaith, a Kuwaiti preacher who gained worldwide infamy after the September 11 attacks, had lived in Iran since early 2002, and was reportedly held under a loose form of house arrest beginning in 2003. Abu Ghaith’s departure from Iran was first reported by the Kuwaiti press, which has long tracked the influential cleric because of his following inside Kuwait and beyond. The preacher was stripped of his Kuwaiti citizenship in late 2001 after promising another al Qaeda strike on America during an appearance on Al Jazeera. Al Watan, an online Kuwaiti newspaper, reported earlier this month that three batches of al Qaeda and Taliban terrorists have been released by Iran in exchange for the release of Heshmatollah Attarzadeh, an Iranian diplomat who was kidnapped by the Taliban in northern Pakistan in 2008. Abu Ghaith was among the terrorists released in the third and final batch. US intelligence officials contacted by The Long War Journal say the account is credible. But, these officials say, Ghaith’s “house arrest” was really a form of safe haven. Abu Ghaith garnished widespread media coverage in the weeks following the September 11 attacks. In a statement released in October 2001, he praised the 9/11 hijackers and threatened more attacks. “The actions by these young men who destroyed the United States and launched the storm of planes against it have done a good deed,” the Kuwaiti said, according to a transcript published by BBC News. Abu Ghaith’s praise for the September 11 attacks is not surprising. The 9/11 Commission found that there was a schism within al Qaeda in the summer of 2001 over the impending attacks on New York and Washington. Several high ranking al Qaeda members objected to the operation, fearing that it would compromise al Qaeda’s safe haven inside Afghanistan by provoking a significant American reprisal. Abu Ghaith was not one of the terrorists who objected, however. The Kuwaiti preacher gave the operation his blessing. Ghaith’s threat is one of several made by al Qaeda in this vein. Obviously, al Qaeda has failed to launch an attack utilizing WMD. But the terrorist group has long sought such a capability and had active biological and chemical weapons programs in pre-9/11 Afghanistan. On October 8, 2002, two al Qaeda operatives opened fire on US Marines who were training on the Faylaka Island in Kuwait. One Marine was killed and another was wounded. As explained by Stewart Bell in his book, The Martyr’s Oath, the gunmen were recruited and indoctrinated by Abu Ghaith. One of the gunmen was a Kuwaiti named Anas al Kandari, who was killed in the firefight. According to declassified documents produced at Guantanamo, a current detainee named Faiz al Kandari is related to Anas al Kandari. In addition, the two received training along with Abu Ghaith at one of Osama bin Laden’s training camps in pre-9/11 Afghanistan. 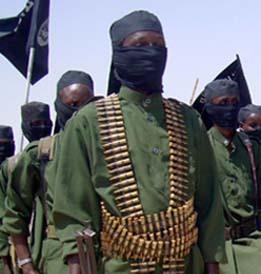 The detainee is related to one of the al Qaeda members responsible for the attack on U.S. Marines on [Faylaka] Island, Kuwait on 8 October 2002. 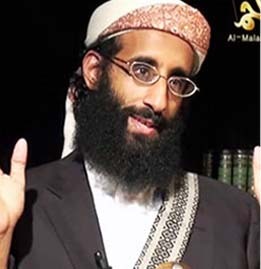 This relative is considered by his peers as among the best al Qaeda cadre. Additionally, the detainee, Salayman Abu Ghayth, and the detainee’s relative attended an airport training camp near Qandahar. A DC district judge denied Faiz al Kandari’s petition for a writ of habeas corpus earlier this month. US intelligence officials at Gitmo concluded that Faiz, who was given the internment serial number 552, was an influential al Qaeda recruiter and advisor with ties to Osama bin Laden. According to Al Watan, Saad bin Laden, Osama’s son, and Saif al Adel, one of al Qaeda’s most senior military planners, were also part of the deal for Heshmatollah Attarzadeh. Both reportedly left Iran after receiving refuge there since late 2001. Saad left Iran in 2008 and was reportedly killed in a US airstrike in northern Pakistan in 2009. But in conversations with the Long War Journal, US intelligence officials cautioned that Saad’s death has yet to be confirmed. Al Qaeda typically releases martyrdom tapes when senior terrorists are killed. No such tape has been released for Saad, the officials pointed out. Although Abu Ghaith, Saad bin Laden, Saif al Adel and other senior al Qaeda terrorists were reportedly under “house arrest,” it was a loose form of detention. “House arrest is a convenient cover for high-level meetings,” one US intelligence official explained. 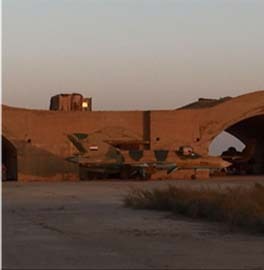 Iran also continues to allow the al Qaeda network to operate on the mullahs’ soil. Saad bin Laden and Saif al Adel were implicated in terrorist attacks in 2002 and 2003. Saad was implicated in the April 11, 2002 bombing a Tunisian synagogue, as well as the May 12, 2003 attacks on three separate apartment complexes in Riyadh, Saudi Arabia. Saif al Adel, who received training from Hezbollah and Iran in the early 1990s, was also implicated in the Riyadh attack. 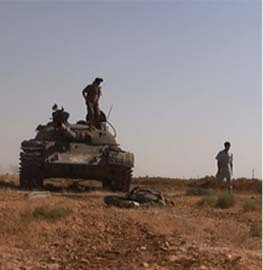 The pair was in contact with the al Qaeda cells that pulled off the operations. After the Riyadh bombings, American and Saudi officials complained about the al Qaeda network operating on Iranian soil. It was after these complaints that Iran placed a cadre of al Qaeda leaders under “house arrest.” But the al Qaeda leaders continued to meet and plan on Iranian soil, while being careful not to raise international scrutiny once again. There is evidence that al Qaeda operatives continue to receive training inside Iran, along with Taliban fighters, as well. Iran’s behavior can be explained by way of analogy. Like a corrupt cop in league with the mob, the Iranians have been willing to clamp down and turn over small-time operatives, while allowing bigger players to operate with impunity. And some senior al Qaeda terrorists, like Abu Ghaith, have now gone free. The terms of the supposed quid pro quo for the kidnapped Iranian diplomat remain murky. And the timing is suspicious. According to the US Treasury Department, which designated several members of al Qaeda’s network in Iran, Saad bin Laden may have left Iranian custody as early as September 2008. But Heshmatollah Attarzadeh was reportedly kidnapped two months later, in November 2008. So, it seems unlikely this was really an exchange of hostages. It is possible that there is more to the deal than meets the eye, just like the Iranians’ concept of house arrest. Raises the question asked before, but never too seriously considered, as to whether or not Osama Bin Ladin and the other Al Qaeda leadership figures are at safe harbor in Iran. I know attacking Iran will not be remotely like Iraq or Afghanistan (which are vastly different from each other), but now that we are somewhat freed up from Iraq, maybe now is the time. Many said Iran would have been a much better target than Iraq before that war. I know we would have at least one country side by side with us (Israel). Iran Govt, Pak ISI and Saudi Religious authority are no friends of the West and must be defeated! 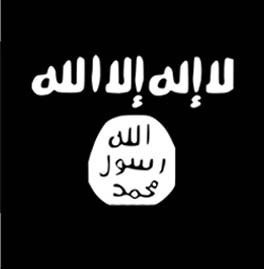 When will the world awaken to the real dangers that are lurking within the Middle East and our borders (all nations). Iran is providing support to every Islamist terrorist organization and anti-western governments. Let see Hamas, Hezzbolla (Spelling? ), Al Queada the list goes on. The President of Iran meets with the leader of the Nation of Islam within the US. I hope that although we have much better intelligence now than before 9/11 that it is not noise covering up a much bigger event. 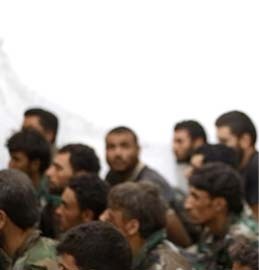 Occupying Iran would take about half a million combat troops with light RoE for at least two-three years while retraining the existing army and moderate militias. Reported release of senior leaders like Sayf Ul Adl and Suliman Abu Ghaith may be true but they would not be willing to move out of Iran since world is on hunt to catch or kill them. Iran can still afford to disengage from agreement with Al-Qaeda and may have proposed to released leaders to stay free in Iran thus would allow Iran to carry clean face in the eyes of the World. Possibility of not releasing these leaders as part of their policy also exist.